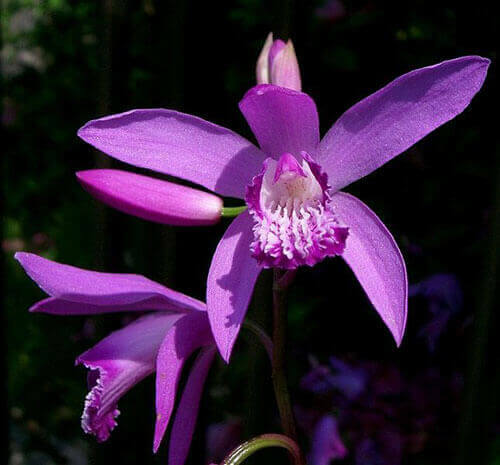 Bletilla is a temperate, terrestrial genus of orchids containing 9 species distributed through China, Japan and Taiwan and Vietnam. The name is actually a diminutive of Bletia because of the resemblance between the two genera even though Bletia is a New World genus. The pseudobulbs resemble spreading corms which usually sit at ground level. Each pseudobulb generally bears several pleated leaves around 40cm long. The racemes of flowers emerge from the center of the year's new growth before it is mature, during spring and early summer. The flowers vary in colour from white to purple, and all species have four pollinia. The tubers resemble a horn or claw. They are grayish-white or yellowish-white in appearance, with concentric rings and brown rootlets. They have a hard texture and do not break easily. Bletilla striata is the most common form found in the nursery trade and is often labeled simply as 'Hardy Orchid' or 'Chinese Ground Orchid'. This beautiful and hardy deciduous orchid has the distinction of being one of the first orchids in cultivation in England dating from around 1794. The very flat knob-like tuberous root system is typically sympodial, expansive and each shoot is of annual duration only. On established plants, almost every new growth shoot has a flower spike before leaves fully develop. Each shoot can have up to fourteen beautiful rose-mauve flowers with a ruffled lip about 30mm diameter, scentless and looking something like a miniature Cattleya orchid flower. An established clump can have literally dozens of flower spikes flowering in the late Spring and the clumps only increase in beauty with time. They rarely exceed two feet in height.